Educating yourself is one of the best things you can do for you and your dog! The information below will help to introduce you to some of the many resources available from dedicated dog professionals and guardians. Our hopes are that this information helps you to strengthen your relationship with, and understanding of, the dog with whom you share your life. Choosing a Daycare Guide An informative guide by us for you to print and use as you interview dog daycares. iSpeak Dog Learn how to speak dog in an easy 1, 2, 3 formula the whole family can follow. The Family Dog a great resource for helping children and adults learn how to be safe with dogs while still having fun. Stop the 77 When 50% of our children are being bitten by a dog by the time they are 12 years old and 77% of bites come from their family or a friend’s dog – that’s an opportunity for education that anyone who loves kids or dogs simply cannot ignore. They’re staggering statistics and ones I want to help change – that’s why I present the Stop the 77 programs in schools. C.A.R.E. for Reactive Dogs is a website dedicated to helping owners living with a reactive dog. Fearful Dogs.com is a website dedicated to helping fearful, shy and anxious dogs. The Muzzle Up! Project is a community for dog owners and professionals. We aim to reduce the stigma associated with muzzles and promote muzzle safety, education and awareness. Your Pit Bull and You is a group committed to highlighting pit bulls in the most positive light, promoting humane, reward-based training and paying it forward. 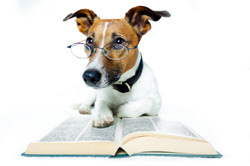 While their focus is on pit bulls, the wonderful information they share goes for all breeds! The Culture Clash by Jean Donaldson This book has shaped many minds on how they see their dogs. Dogs are not humans. Dogs are clever and complex creatures that humans need to take the time to understand in order to live together successfully. A must read for all who seek to understand their dogs better. Dog-Friendly Dog Training by Andrea Arden This book does a wonderful job of breaking down how animals learn and how to train them into a very easy to read format. Inside of a Dog by Alexandra Horowitz This book is thought provoking and gives you a whole new way of looking at your dog. Alexandra expertly weaves scientific knowledge on dog cognition and perception along with personal reflections on her own dog's behavior. Low Stress Handling, Restraint and Behavior Modification of Dogs & Cats by Sophia Yin, DVM An outstanding collection of over 1,600 instructional photos and a DVD. A must have for anyone in the animal care world. It teaches you how to set up animals to have a more pleasant trip to the clinic and gives training how to's for dedicated owners. Treating Separation Anxiety in Dogs by Malena DeMartini-Price This book has and continues to change lives of owners and dogs battling separation anxiety. Doggie Drawings is a fantastic site for visual aids on dog training and behavior-related illustrations and super adorable dog portraits by Lili Chin.